22 August 2018–The bright flashes that lit up the evening skies near Detroit, Michigan earlier this year were not the only signs of the meteor that disintegrated in the atmosphere on 17 January 2018. The meteor explosion was also captured by infrasonic microphones and seismometers, offering a rare chance to compare these data with satellite and ground camera images. In a report in Seismological Research Letters, a team of scientists led by Michael Hedlin of Scripps Institution of Oceanography use these data to pinpoint the time, location and height of the bolide disintegration, and to calculate an approximate yield for the explosion. Bolides, sometimes called “fireballs,” are extremely bright meteors that explode in the atmosphere. They estimate a likely yield within the range of .8 to 8.1 tons of TNT, and probably equivalent to 2.2 tons of TNT. About 2000 bolides this size or larger pass through the Earth’s atmosphere each year, which makes the Michigan bolide a particularly interesting event to study, said Hedlin and colleagues. Scientists would like to know more about how frequently we can expect to see near-Earth objects of this yield, to assess the potential threat they pose on the ground. Researchers also use data from bolide bursts as “test cases” to determine how well infrasound and seismic instruments can locate and characterize secret nuclear test explosions. 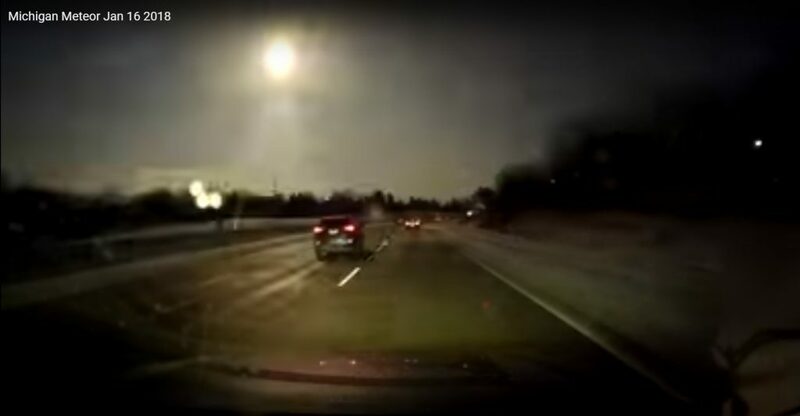 Other bolides such as the February 2013 Chelyabinsk, Russia fireball also have been studied intensively through infrasound, seismic and optical observations—and made famous through “dashcam” videos taken by Russian drivers. But “it’s pretty unusual for such immense events to occur over a heavily instrumented area; they could be expected to occur once every several decades,” said Hedlin. When the Michigan bolide traveled through and exploded in Earth’s lower atmosphere, it produced large shock waves and a variety of soundwaves, including waves in the low-frequency or infrasound range below 20 hertz. These waves were detected by infrasound microphones at seismic stations in the Central and Eastern US Network (CEUSN), deployed through the eastern half of the continental United States. The researchers were also able to detect the burst in seismic wave data collected by seven stations in Michigan, Ohio and Ontario. Hedlin and colleagues made calculations from these data to determine the location, height, timing and yield of the bolide’s disintegration. They were able to compare these values with the “ground truth” for these characteristics as calculated by optical observations of the bolide taken from numerous cameras on the ground and from recordings by the Geostationary Lightning Mapper instrument on a National Oceanic and Atmospheric Administration (NOAA) satellite. The infrasound and seismic calculations were consistent with the optical observations, the researchers concluded, although some of the calculations—such as the location and yield provided by infrasound data—contained a large amount of statistical uncertainty. The seismic data, however, were able to pinpoint the location and height of the burst within kilometers, in agreement with the optical data. If the Michigan bolide is the smallest detectable event that can be measured using CEUSN data, researchers should be able to detect about 15 events of this size or larger each year in eastern North America, Hedlin and his colleagues write. The Michigan analysis could also help researchers who study clandestine nuclear tests “make some inferences about how detectable similar-sized anthropogenic events would be—how far away from the explosion source we’d be able to detect signals, for example,” said Hedlin.